I've wondered that very same thing. I've never been crazy about the Jag-stang bodies at all. They just look like a project gone wrong to me. I'm loving this project, though. 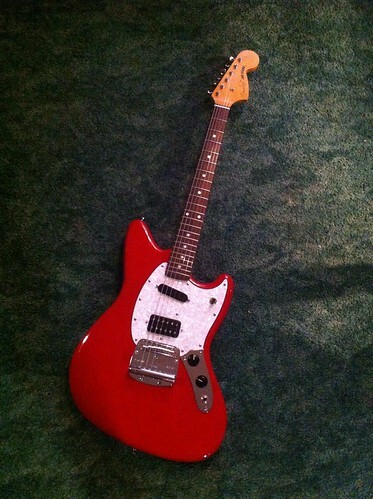 To me, that's what Jag-stang should look like. Very cool. Makes me want to do something similar. He talked to Kurt Loder's guys about not being happy with it/needing to change some things very shortly before his death. I think Fender's story was that they built a bunch of bodies and take them to him on tour, and he'd go "take some off here" or "make it balance right" etc... so it was a bit of long distance trial-and-error to arrive at the shape. I am one of the crazy people who love the Jag-Stang body. I love it more contoured like my black warmoth body one, but it fits my body well. Note to people that don't really know about Jag-Stang necks... They are a lot fatter at the heal. I needed to do a lot of sanding to get this neck to fit the body. They extend out more to the bottom like a V.
This turned out great. This jag-stang in sonic blue would be a dream. What kind of wood did you use for the body? That looks the business!! Great project. I'll get to it haha! When did this get renamed to "Blaze it" lol? Wait, this is the two point oh update? If I still had it haha. It's long gone. I don't even remember who I sold it to.